This half term we have transformed some PE lessons into a sensory experience by using fluorescent equipment. Classes Green Island, HN and BK have taken part. The students have enjoyed warm ups using a glow in the dark parachute with shiny stars. 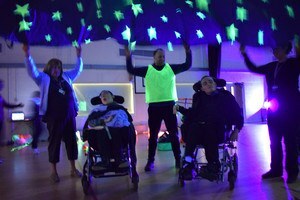 In lessons, students have challenged themselves to glow in the dark sporting challenges taken from the Motor Activity Training Programme and have excelled in their efforts. Using sensory techniques in these sessions has brought a new dimension to PE which the students really enjoy. The students continue to make superb progress. We would like to thank all the staff for their fantastic support in these lessons.